7 March, 2013 - Äntligen, Cards, Ska Vi Ta En Fika? Hi everyone! I have had spring on my mind lately, and so today I share with you a project, inspired by the colors of spring and this beautiful Maja Design Mood Board! Here is my take on these lovely colors, using some very, very pretty Maja Design papers. First up, I created a vintage-inspired card with a fresh take using these cheery colors and many layers of lace, and pretty trims. 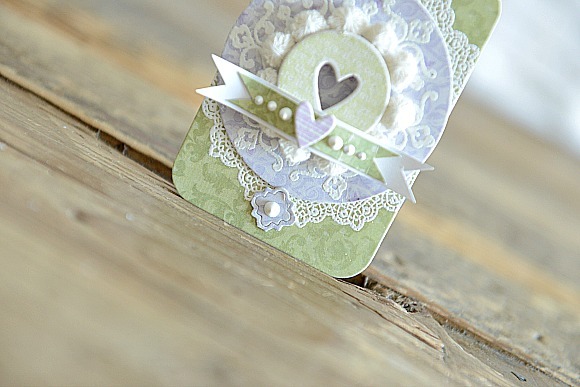 I adore combining soft colors and plenty of texture, to create my cards. I always find that the textured bits always stand out so much more when paired with soft colors. 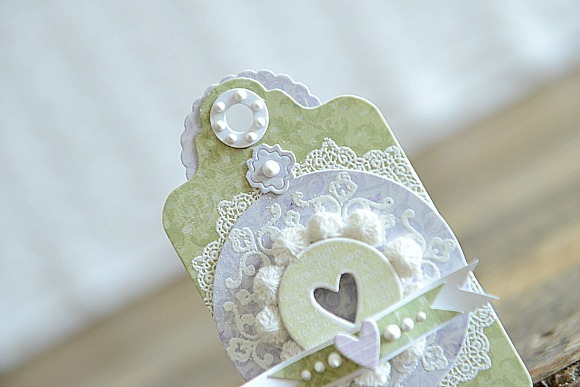 To make this card, I started out with a white card base, and layered a die-cut button card, soft lilac lace, as well as this gorgeous, green Maja Design paper (Marzipanbakelse). I stitched the layers to the card base, and then I added a die-cut quarter-foil motif out of this beautiful purple Maja print (Syrenen Blommar), as well as a vintage trim from Maya Road. 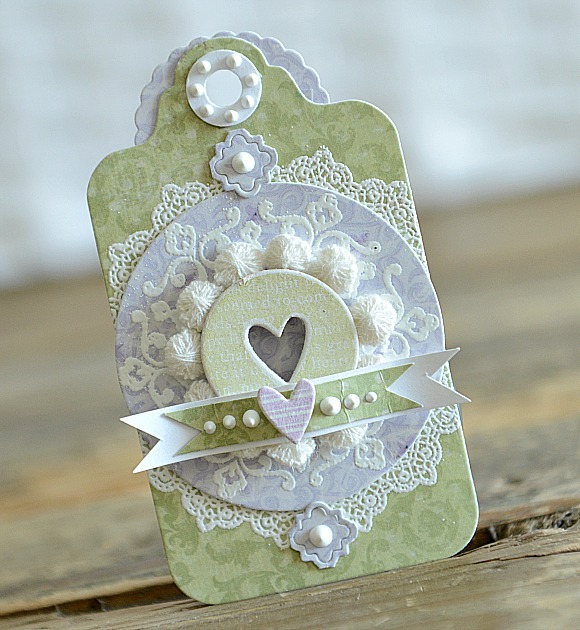 To the center of all of these layers, I added a die-cut and stamped heart and circle combo from Papertrey Ink. Two very sweet, and slightly embossed leaves finish this little embellie off perfectly. Just below the button card layers, I added two white banners and stamped the top layer with a lovely sentiment. Oh I forgot to mention, before I did any of the above steps, I stamped the background of the card (bottom portion only), using some pretty dots and dashes and soft green and purple inks. To add a bit of dimension to the stamped bits, I adhered left over punch-outs from the die-cuts, as well as a little heart button (which I softly distressed with white paint). I have to admit, I loved the color combination so much, that I decided to keep creating, so I made a matching gift tag! I used this green paper from Maja Design as the background. To the back of the tag, I added a scalloped circle cut from more pretty Maja paper. Just below that, I stamped and embossed a doily motif in white, and then began with my layers all over again. First, I added a die-cut circle from this purple Maja paper (onto which I also stamped and embossed), then a tiny little circular row of the pretty Maya Road trim, and to finish it off, a die-cut and stamped circle tag. To that I added a little banner embellishment, and a few liquid pearls. So easy to create when you have beautiful inspiration like the Maja Mood Board! Supplies: Maja Paper (Ska Vi Ta En Fika – Marzipanbakelse, Antligen – Syrenen blommar), white cardstock, Papertrey Ink stamps (Love Lives Here), The Craft’s Meow stamps (Inspired by Audrey), Maya Road vintage trim, Papertrey Ink dies (Button Card die, Love Lives Here dies, Tag Sale #1), Liquid Pearls, Lavender and Soft Green ink, Lace and Buttons from my stash. Categories: Äntligen, Cards, Ska Vi Ta En Fika? So delicate! Love it. Your details are so gorgeous. so many intricate and beautiful details!!! wow – perhaps the most gorgeous card I’ve ever seen.